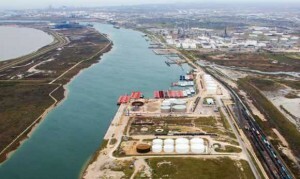 Energy Transfer has reached an agreement with Trafigura for liquids capacity that supports the development of a pipeline supplying the Port of Corpus Christi. Energy Transfer will utilize existing infrastructure to construct an 82-mile, 100,000 b/d pipeline system from McMullen County to the Port of Corpus Christi. Leveraging underutilized natural gas pipelines allows Energy Transfer to have the pipeline running in 9-12 months. — Jeff Kopp, Trafigura's Director of Oil for North America. The pipeline will deliver crude to Trafigura's Port of Corpus Christi Terminal, where a $500 million construction project is underway on a second deep-water dock that is 850 ft long and has a draft of 45 ft. Once complete, the terminal will be able to handle Aframax vessels (245 meters or ~800 ft long). Aframax ships are medium-sized oil tankers with capacity of approximately 750,000 barrels. Trafigura states the facility will be able to handle three medium range tankers and two inland barges at one time.